The first thing you can do to improve a website’s search engine friendliness (search engine optimization) is to maximize the keywords you use in your content. One of the things that search engine robots and spiders do is search for meaningful content within the text on pages that they crawl. This means that the sites you design need to help those bots find that content by including site-specific keywords that identify a company’s products and services, especially on the home page. Keywords can be any words or short phrases (keyphrases) that describe the product, service, or information on the site that needs to be advertised. If your site sells products, tell the world about them using clearly identifiable keywords that visitors might use. This can help visitors around the world using search engines to more readily find a particular website. Keep in mind that the keywords within the text of the site’s pages can be the same as any keywords listed in the keywords meta tag. However, because content keywords and key phrases can be integrated into the text in the body of the page, you have much more latitude for including the most popular keywords within the text that the site’s target audiences are likely to use when doing a search engine search. Verify that the text on each page — especially the home page — includes descriptive keywords and key phrases. For instance, if the website offers printing services and uses only chlorine-free 100 percent post-consumer recycled paper and vegetable-based inks, Chlorine-Free 100% post-consumer recycled paper and vegetable-based inks would be great key phrases to include in the page’s text. Find ways on every page to hyperlink any keywords or key phrases to other relevant pages on the site. If you see keywords that aren’t yet linked to somewhere else on the site when they should be, add them. 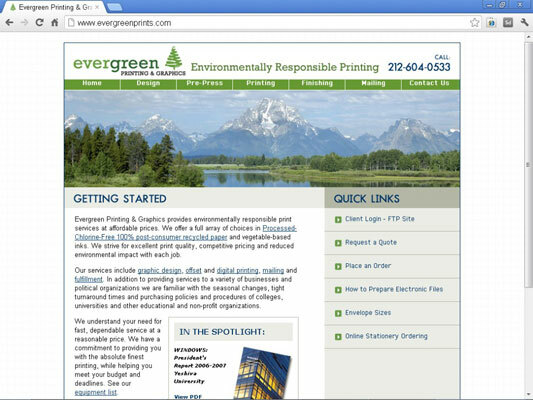 For instance, if the copy on a page includes the phrase, “Our services include graphic design, offset and digital printing, mailing and fulfillment,” you can easily turn the words graphic design, offset, digital printing, mailing, and fulfillment into individual hyperlinks that link directly to those five pages on the site. To emphasize certain words or phrases within the page content, mark up headlines and bylines using headings tags such as <h1>and <h2> and mark up other important text with <strong> (bold) and<em> (italic) styles. By using these heading and emphasis tags, you’re alerting search engine robots that the content contained inside those tags is likely to be more relevant to search engine users than other content on the page. If you’re advising clients about improving the content on their pages, tell them not to worry about being too conservative with the amount of content placed on every page. Many site owners think that having too much copy will scare away readers. In fact, some SEO guidelines recommend having a minimum of 200 words on every page so that the spiders and robots have something to read and index. When you have finished reviewing and updating your site, the content should be well marked up with heading, italic, and strong tags for emphasis; the copy should include lots of descriptive keywords and key phrases; and when applicable, those keywords and key phrases should by linked to other relevant pages on the site.